The shoulder can be prone to injury in the golf swing. The shoulder is the fourth most commonly injured site for golfers, according to Hughston Sports Medicine Foundation, a non-profit medical campus in Columbus, Georgia. Golf relies heavily on the muscles, tendons and joints in this part of the body just to get the ball off of the tee. With an injured shoulder, the game becomes much more difficult to play, so golfers need to learn how to spot and treat shoulder injuries. Golf shoulder injuries fall into three basic types: overuse injuries, traumatic injuries and joint degeneration. The Hughston Sports Medicine Foundation indicates that amateur golfers experience overuse injuries more often than traumatic injuries because they rely more heavily on their rotator cuff muscles than the pros. A combination of overuse and poor form can cause inflammation of the rotator cuff tendons. 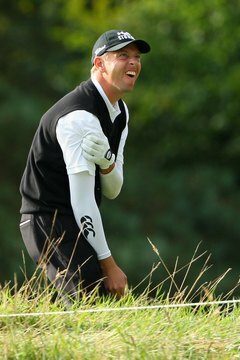 Traumatic injuries common in golf include strains and tears. These occur when the conditioning of the muscles is insufficient to combat the force applied during the swing, causing too much pull on the muscle. Joint degeneration, such as arthritis and bone spurs, occurs most commonly in golfers over the age of 35 and can cause pain and stiffness, according to Hughston. Not all golf shoulder injuries require a trip to the doctor. For mild to moderate pain that did not start suddenly, treat it by decreasing the amount of golf you play, as the Hughston Sports Medicine Foundation recommends. Use nonsteroidal anti-inflammatory medications to control swelling and pain. You may also place the injured arm in a sling for approximately 48 hours after the injury. MSN Health recommends you use ice, not heat, to control pain and swelling for the first 48 hours. Heat can increase swelling in injured tissue. You can use heat after 48 to 72 hours, provided it does not increase swelling. If you do not find your pain subsiding after seven to 10 days of at-home care and rest, talk to your doctor. Also, call your doctor right away if the pain occurred suddenly and was intense. If rotating your shoulder in a particular direction causes excruciating pain, Golf Healthcare.com recommends calling your doctor immediately. Numbness or tingling in the shoulder or arm also warrants a call to the physician. Your doctor will use x-rays or MRI scans to pinpoint the cause of your injury. Chronic inflammation of the rotator cuff tendons, or subacromial bursitis, often requires arthroscopic surgery to remove inflamed tissue. Your doctor will also use arthroscopic surgery to remove bone spurs in the shoulder or repair torn tendons. Once the area has healed sufficiently, you will enter into a physical therapy program to rebuild the strength in your muscles. The best way to deal with shoulder injuries in golf is to avoid them altogether. According to Golf Healthcare.com, using proper form prevents many of these injuries. You also need to warm up the muscles by stretching your arms, shoulders and back and doing some brief cardiovascular exercises, such as a little bit of jogging, prior to playing a round of golf. Finally, condition the rotator cuff and scapular muscles through weight resistance training when you are not on the golf course.